For over a decade each Christmas I would come to Florida and visit my Aunt Irene for a month. She would phone me in the fall and ask me if I was coming down again. I again would fane being upset and say "let me get this straight, you want me to come down again, stay at your place for free, eat for free and drive your car for free, is that right" and she would say "yes" and I would reply "well alright". She was a Dolphin fan. No let me say a Dolphin fanatic. During football season she would answer her phone "Dolphin Country". If you were around on game day she screamed and hollered like a wild fan watching the game on TV. At Christmas, her birthday, her anniversary the best bet for a present was some Dolphin's paraphernalia. Eventually her house became a Dolphin Museum with pictures, statures, footballs, helmets etc all with the Dolphin logo on it. She passed away recently and I sorely miss her. So on Sunday, Jan 1st in her memory and to cheer her team on Elizabeth and I went to the Dolphin game at the Sun Life stadium. Coming down the main highway as you approach the stadium you notice more and more cars with Dolphin flags flying from them. The traffic grinds to a halt and yet it moves along and in about 20 minutes we are parked in one of the great lots that surround the stadium. We had come early to witness that greatest of American spectacles the tailgate party. I had visited a tailgate party years ago and it impressed me that is something like in my mind a jostling match from the Middle Ages. Tents with pennants flying from them, fatted calves being offered up on open spits, lots of beer while waiting for the jostling to begin. Soon the jostling game would begin. We moved towards the stadium and had to go through a security search. Elizabeth and I were separated since males are searched by males and females by females. As I approached the security guard he shouted out no large bags, no bottles and no weapons. I of course had my large back pack, four bottles of water and a jack knife attached to my keys. There was no turning back so I held the bag in one hand and approached the guard feeling I would be severely nailed. As it turned out he passed me through with a cursorary search. Elizabeth who had witnessed my whole tribulation was relieved. She was as I disturbed because I had gotten through. Maybe you saw the movie where the terrorists want to blow up a bomb at a NFL football game. 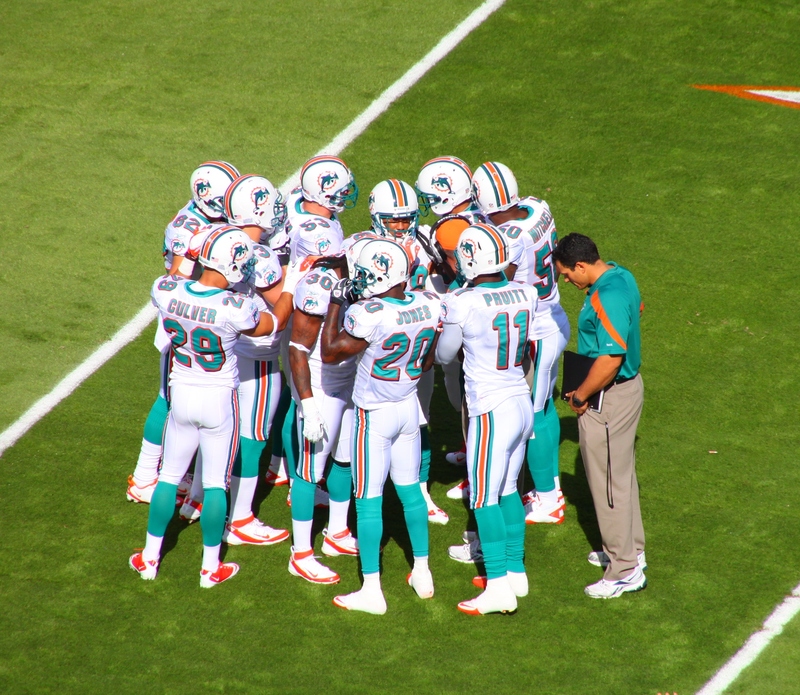 The Dolphins were playing the New York Jets and the game see sawed back and forth. I had spend about $90 a seat and with tax and admin charges the total bill came to $260. Add $20 for parking and I felt it was reasonable. The stadium holds about 75,000 and was half full which surprised me. The Dolphins won and I sure I heard a loud scream at the end of the game that seem out of this world. We drove into Miami to Lincoln Road. This is a street were they closed it permanently for about 8 blocks and it is like a long piazza. Hundreds of people were walking up and down. Outdoor restaurants abound. There are two Starbucks a dozen art galleries, a dozen jewelers and a dozen ladies dress shops. We had supper at an Italian restaurant and as usual overate. The reality is we could have ordered for one and still be stuffed from all the food. Such is life in America.